I love to see when our educators have so much pride in their schools and their kids. And even better when people of importance take notice. Brian Suits, principal at Dalton Middle School completed an application for GA Principal of the year – and he won for 2015-2016. He applied because he wanted to promote the success his school has had such as improving tests scores and overcoming a bad economy that had put many of his students into poverty. When he won, he believed that he would be going to Washington DC, as each winner had in the years prior. This year, GA sent only one representative and it was the GA High School Principal of the Year. Suits was upset because he had told he his students he was going to go to Washington DC. 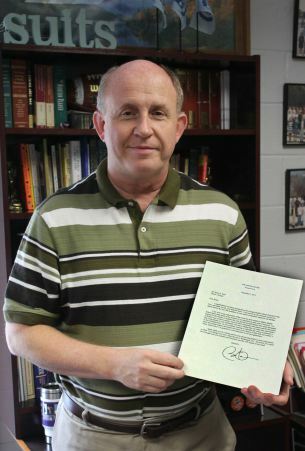 Instead of disappointing them, he wrote letters to express his thoughts – to Governor Deal, to the National Association of Secondary Principals, GA state superintendent and President Obama. He didn’t mail them at first, and as he edited them they became less about his opportunity to go to Washington and more about the successes his school had accomplished. Over the summer, he decided to mail the letters, after yet another school tragedy. While the White House receives over 20,000 letters per day, Suits letter made it in the daily 10 letter pile to the President. And the President wrote back. He wrote about Luis Orozco, now a freshman at Dalton High, who picked up garbage after his wrestling match so the custodians wouldn’t have to stay late. He wrote about a receptionist they tutored so she could get her U.S. citizenship. He wrote about a student who asked if Suits could be “sort of be like his dad” since he was living with a single mother. He wrote about climbing tests scores and becoming the first Literacy Collaborative middle school in the United States. Suits also mentioned Dalton Middle School’s groundbreaking sensory room (there are only around 10-12 of these rooms in schools around the nation) — a room designed to calm and sooth autistic children when they have an outburst. On Sept. 11, Suits was going through his mail when he came to a large envelope from the White House. As Suits read the letter, he realized it wasn’t just a form letter. Obama himself had actually read his letter. Suits told the teachers and students who had designed the sensory room that the president had mentioned their work in his letter. “They got very emotional. One teacher teared up,” said Suits. Both Robertson and Ross said they called their parents to tell that their work had been mentioned by the president of the United States. “Out of millions of people, he knows us,” said Ross. “It’s crazy because the president knows about me. He knows what I did at school and knows about my work,” Robertson said. Suits also made a trip to Dalton High to show Orozco the letter. “When I got to the part where his name is, his eyes teared up. He said, ‘He knows my name,’” said Suits. How do we get to a fair funding formula? Jarod Apperson recently wrote a response to one of Maureen Downey’s articles about the new proposed teacher salary model. He is a graduate of NYU in both finance and accounting, Apperson is pursing a doctorate in economics at Georgia State University, focusing on education data analysis. He writes the Grading Atlanta blog and serves on the board of the public, non-profit charter Kindezi Schools. Having a focus on education data analysis and Ph.D. in economics I would ask Jarod what he thinks would be an acceptable new funding formula. Maybe he has made a recommendation and I have missed it? It makes no sense to rely on the Legislature for a deep-dive reform of education. Lawmakers have neither the expertise to address what are complex questions nor the ability to respond with agility and accuracy to the fast-changing education landscape, witnessed by the fact the funding formula they’re attempting to revise goes back three decades. Our current funding system, introduced in 1985, is complicated but the crux of it can be boiled down to this: about 63 percent of the money earned is based on needs of the students served while 37 percent of the money is driven by characteristics of the teachers employed, incentivizing schools to hire teachers who fit certain profiles that the state deems more valuable. A state-level incentive structure makes sense if legislatures are incentivizing schools to do things that lead to greater achievement, but it is inefficient if the state is incentivizing things that don’t work. The evidence suggests that Georgia’s Legislature is not very good at prescribing education approaches, and the current incentive structure implemented by the state does not align with what we know about the relative value of training and experience. His demonstration of the legislature incentivizing things that do not lead to greater student achievement is how the pay scale jumps greatly for advanced degrees, but takes a teacher with a bachelor’s degree 14 years to make the same as a teacher with an advanced degree and no teaching experience. He recommends that we reward years of experience over the advanced degree also in an effort to retain our teachers. For example, there is clear evidence teacher experience matters, and year-to-year improvements are particularly dramatic early in a teacher’s career. A fifth-year teacher is substantially more effective than a rookie. If the state’s incentive structure were strategic, it would give teachers large raises in the first five years. Instead, Georgia teacher earnings grow a paltry $2,036 over that period, or about 1.5 percent a year. That’s measly compared to the early-career salary growth seen in other skilled professions like technology, accounting or engineering. Rather than paying teachers substantially more as they gain valuable early-career experience, the state offers huge incentives for something that does not lead to greater student achievement: advanced degrees. In Georgia, it takes 14 years for a teacher with a bachelor’s degree to reach the starting salary of someone with zero experience and a specialist degree. This emphasis on advanced degrees over experience is not strategic. It doesn’t benefit students and doesn’t make teaching a more attractive profession. Instead, the only real winners from this scheme are the degree-granting institutions that collect tuition from Georgia’s teachers. Funding formulas are a problem all over the country. Some legislatures, like in Massachusetts, don’t want to admit that they haven’t met their own benchmark for funding schools because of the automatic infusion of cash required to fix it. So they make little tweaks to get by, but won’t commit to really fully funding schools. The one thing I will say for Massachusetts that I don’t believe Georgia does, is MA adjusts its state contribution based on a formula of what the LEA can pay. In Worcester, the state paid ~75% of the total LEA budget. But in other LEA’s where the city could pay more of their share, the state paid a smaller % (and because the communities were affluent the cities contributed funds over the budgeted amount). It appears that in DeKalb County, the state contributes closer to 30% of the costs to run the school system and the county has to make up the remaining 70%. It also sounds like the state is in a catch 22 where I assume the legislators want to see progress before they contribute more funding, but the schools are trying to say they need more funding to demonstrate progress. Maureen Downey wrote this article this week about whether we are focusing enough on principal quality. The references she makes refer to who to retain principals and how busy the job is. From my experience in DeKalb County, it’s been less about how to keep good principals and more about what to do about the really awful ones? No one seems to fire teachers….not sure what that is about. Last year there was a great uproar over the Principal at Southwest DeKalb HS. She was simply transferred to another school (so she can torment another whole set of parents, students and staff?). Avondale Elementary School had an awful principal for almost 10 years. That principal was the reason the Museum Charter School was created. That principal finally left at the end of 2013-2014 school year. The new principal is fantastic, and I am not concerned about him staying because he is building great roots in the community. I’m concerned about the lack of principal accountability by regional superintendents and the shuffling of principals to other schools when they probably should be fired. Why can’t we fire principals? For a non union state, sure seems like those protections are in place – that or extreme nepotism! I know that DeKalb Schools recently received grant money to support training and accountability for regional superintendents who supervise our principals. Looks like I’ll need to check in on that and see what progress has been made. Another issue that Maureen doesn’t bring up regarding the role of principals and turnover is the being principal is an administrator role vs an educator role. It’s more commonly accepted that principals spend time teaching before they become a principal. While that experience is truly helpful in understanding the teaching side of the school business, it does not really assist with the business side of the school. Managing staff, outside relationships, parents, all the administrative work, budgeting – the business side of the job is often more difficult for principals who haven’t had a great deal of complementary experience. This FB post came across my newsfeed and I had to read it. You will find Stephen R. Stafford II’s Facebook page fascinating enough. While many teens his age are skimping homework for Facebook time, Stephen is earning credits toward his triple major — pre-med, computer science, and mathematics — at Morehouse College in Atlanta. Stephen started at Morehouse College at 11 years of age because his mother, who was homeschooling him, could not keep up with his potential. The college student is also a talented classical pianist; he began to play the piano at the age of two. Due to a Georgia law which requires a student to be 16 to graduate from high school, Stephen will receive his high school diploma one year before he receives his college degrees. 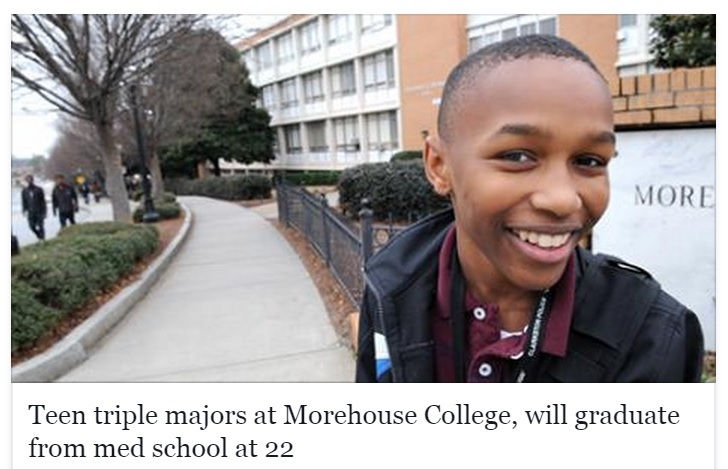 The talented teen intends to go on to Morehouse’s School of Medicine, specializing in obstetrics and infertility. He should graduate from medical school when he is 22. In 2011, Sitan Chen won third prize, a modest $40,000, in the Siemens Competition in Math, Science & Technology for research that advanced studies in mathematical graphs and how computers multi-task data. The 2011 win followed Sitan’s win in 2010 at the same competition. Sitan managed a team which shared the $20,000 prize for solving a math challenge which reportedly stumped mathematicians for 70 years. His double win set a record for Sitan as the first student in the 13-year history of the event to receive back-to-back Siemens Competition national awards. Sitan is currently a freshman at Harvard studying economics and math. He’s a member of the Harvard Glee Club and an analyst in the Harvard College Consulting Group, providing consulting services for businesses, non-profit organizations, and student groups. Sitan wants to become a university professor. When Erin King, then a senior at Columbus High School, received her early acceptance letter to MIT, the college issued a challenge to the class of 2016: Try to “hack” your admission letters. However, they advised the future freshmen not to break into any of MIT’s secure networks, even though most of the newly accepted students probably knew how or could figure out how to do it. Erin had been active for years in her high school’s balloon launch research club. She is also a seasoned ham, or amateur, radio person and knew she could relay the balloon’s coordinates from a vehicle below. She had a “hacking” strategy: Send her acceptance letter into space or close as possible to the edge of the earth’s atmosphere. Erin is definitely a ham: She has achieved the level of Extra, the highest distinction in ham radio operation and named the 2012 Amateur Radio Newsline‘s Young Ham of the Year. Oh, yeah, Erin is also a robotics enthusiast, a cat lover, and a certified scuba diver. Today, Erin is a sophomore at MIT where she studies computer science and electrical engineering. She is happy that she was able to bring Maui, her cat, along with her, since MIT has a few cat-friendly dorms. The one other thought that comes to my mind is that, maybe I could have had a chance to be one of these great students. Or, if I had even half the encouragement, or half to counseling from my counselor – maybe I could have been farther than I am now. It reminds me that there is so much more to accomplish. And that every child deserves the opportunity to have the encouragement and resources to reach their full potential. It’s why I work in school counseling. Don’t placate us, fix our schools! This week I attended a launch meeting of the Delta Teacher Efficacy Campaign, a collaboration aimed at enhancing student academic achievement by focusing on helping educators. I ended up arriving half way through, but made it in time for the Q & A session. Here’s one question from a parent that really stood out for me. He mentioned that we have a great school choice program in DeKalb, basically saying that if you don’t like your school, no problem, go pick one of the others. Problem with that is – parents have to provide their own transportation. What if it isn’t possible for this parent to drop off and pick up at a school across the county? Basically, he never answered the question. He never admitted any wrong doing, or fault on behalf of the county. This is one of the reasons charter schools are popular, especially in underserved areas. They offer a choice that may not be too far away for a parent to provide transportation. They offer a choice to parents who are otherwise forced to send their child to a private school and pay out of pocket. The report finds that over a 10-year period home sale prices were 7 to 13 percent higher in areas with the greatest chance of charter school enrollment. “Although there is extensive research on charter school achievement outcomes, relatively little is known about how the general public values these schools,” said Carlianne Patrick. For elementary school neighborhoods: Homes sold for 9 to 13 percent more than similar homes in priority two zones. For middle school neighborhoods: Homes sold for 8.5 to 10.5 percent more than similar homes in priority two zones. For high school neighborhoods: Homes sold for 10 percent more than similar homes in priority two zones. While this data points to a high demand for homes in neighborhoods with charter school enrollment priority zones, the report also helps refute notions that charter schools erode public schools. 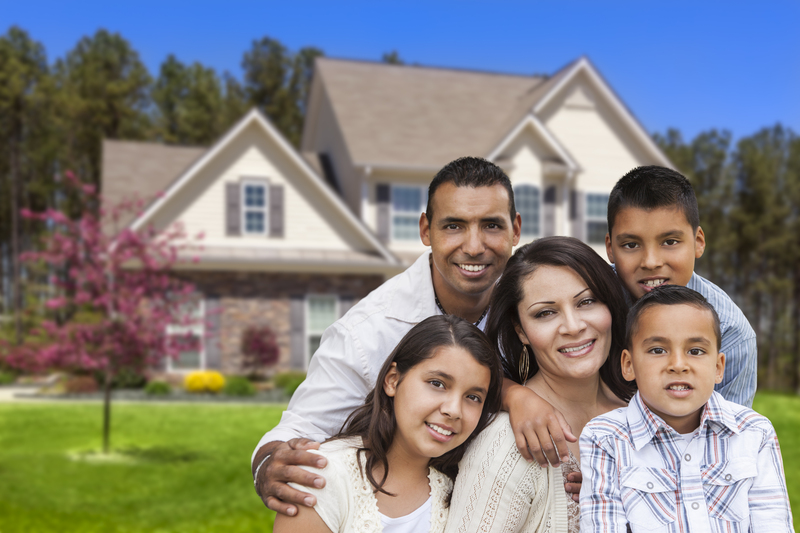 The increased home values mean increased tax revenue, which is a benefit for public school districts. Table 3 indicates that single-family residences in priority one attendance zone sold for an average 7-8 percent more than similar houses located in priority two zones between 2004 and 2013. These results suggest that households value the choice, flexibility, and accountability that characterize charter schools. Tables 4-6 present results by elementary grades, middle grades, and high school charters, respectively. Table 4 suggests a 9-13 percent premium for being located in a priority one zone for a charter serving elementary grades. Table 5 indicates a slightly lower willingness-to-pay for middle-grade charter priority zone one admission probabilities, with priority one zone single family residential transaction values 8.5- 10.5 percent higher than priority two zone values. Households pay an average of 10 percent more for similar houses in high school charter school priority one zones according to Table 6.